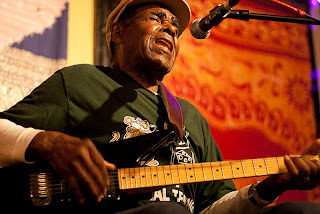 James Lewis Carter Ford (born c. 1920, Forest, Mississippi, United States) is an American blues musician, using the name T-Model Ford. Unable to remember his exact date of birth, he began his musical career in his early seventies, and has continuously recorded for the Fat Possum label, then switched to Alive Naturalsound Records. His musical style melds the rawness of Delta blues with Chicago blues and juke joint blues styles According to records, Ford's year of birth is between 1921 and 1925. According to his half-sister (still alive in Tennessee), he was born in 1922. Starting with an abusive father who had permanently injured him at eleven, Ford has lived his entire life in a distressed and violent environment, towards which he is quite indifferent. Ford, an illiterate, had been working in various blue collar jobs as early as his preteen years, such as plowing fields, working at a sawmill, and later in life becoming a lumber company foreman and then a truck driver. At this time Ford was sentenced to ten years on a chain gang for murder. Allegedly Ford was able to reduce his sentence to two years. He ensuingly spent many of his years in conflicts with law enforcement. Currently, Ford resides in Greenville, Mississippi and for a time wrote an advice column for Arthur magazine. Reportedly, he has twenty six children. According to music writer Will Hodgkinson, who met and interviewed Ford for his book Guitar Man, Ford took up the guitar when his fifth wife left him and gave him a guitar as a leaving present. Ford trained himself without being able to read music or guitar tabs. Hodgkinson observed that Ford could not explain his technique. He had simply worked out a way of playing that sounded like the guitarists he admired - Muddy Waters and Howlin' Wolf. Ford toured juke joints and other venues, for a while opening for Buddy Guy. In 1995, he was discovered by Matthew Johnson of Fat Possum Records, under which he released five albums from 1997 to 2008. Since 2008, Ford worked with the Seattle-based band, GravelRoad. The project began as a single event, with Ford needing assistance to play the Deep Blues Festival in Minnesota in July 2008. GravelRoad, longtime fans of Ford and performers already scheduled for the festival, agreed to provide support for a ten-show US tour for Ford through July. Ford had a pacemaker inserted at the end of that tour, but appeared on stage again with GravelRoad in 2008, 2009 and 2010. He suffered a stroke in early 2010, but despite difficulty with right-hand mobility, managed to complete a successful tour with GravelRoad. This tour concluded with an appearance at Pickathon Festival. Ford and GravelRoad opened the third day of the All Tomorrow's Parties Festival, in New York over Labor Day weekend, 2010, curated by American independent film-maker Jim Jarmusch. GravelRoad backed Ford on his 2010 and 2011 albums, The Ladies Man and Taledragger, both released by Alive Naturalsound Records. Ford suffered a second stroke in the summer of 2012 that limited his public appearances. However, he was able to perform at that year's King Biscuit Blues Festival in October.